EPX General Meetings are scheduled from September through June. During the July and August summer months, we take a break from regularly-scheduled meetings. However, we do host Zoning meetings on the second Wednesday of each month. Stay tuned for more information on our upcoming Summer Social in August! Due to the inclement weather, we have decided to cancel our January Membership Meeting, as the City of Philadelphia has closed their offices (which includes the East Passyunk Crossing Community Center). Please save the date for our February Membership Meeting, which will take place Monday, February 5 at 7pm. Stay safe and warm out there! The June General Membership Meeting will be held Monday, June 5 at 7pm at the East Passyunk Community Center at 1025 Mifflin Street. The meeting will feature a presentation by Bruce Robinson, President of Ss. Neumann Goretti High School, on their upcoming initiatives, as well as a presentation by Bryan Fenstermaker, Executive Director of the Passyunk Avenue Revitalization Corporation, on the construction project at 12th and Morris Streets. The full June agenda may be viewed HERE. 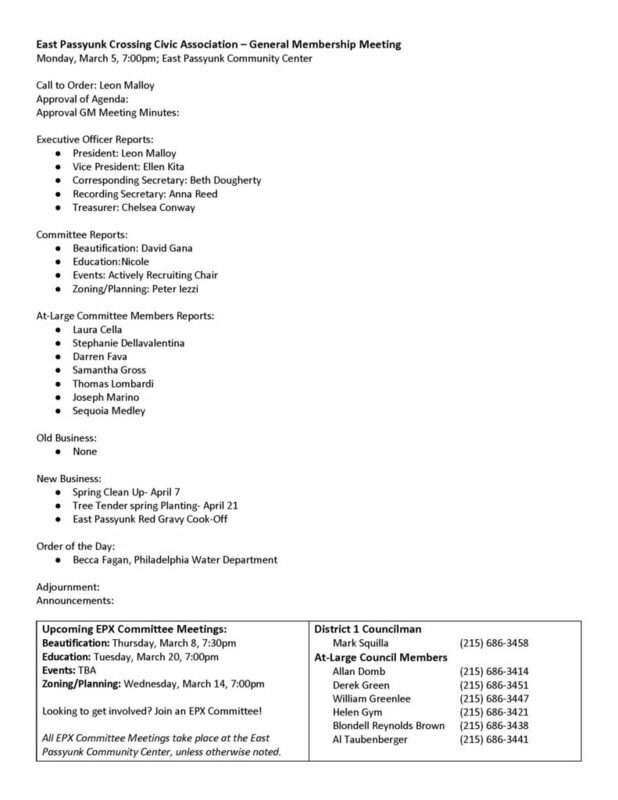 The May General Membership Meeting will be held Monday, May 1 at 7pm at the East Passyunk Community Center at 1025 Mifflin Street. The meeting will feature a presentation by the Philadelphia Water Department about the upcoming projects in our neighborhood. The full May agenda may be viewed HERE. We’re excited to announce that EPX will host the 3rd Annual Italian Red Gravy Cook-Off! Come join us on Sunday, April 23, 2017, from 4-6pm at Ss. Neumann and Goretti High School. Now is your chance to enter the contest! Showcase your best Sunday sauce in this blind-tasting event and you can win $400 in prizes! Not much of a chef? Don’t worry! Come to the event to enjoy the different gravies over macaroni (or as some say, “pasta”), fresh salads, & homemade desserts. A complimentary Buckingham Valley Wine tasting will be provided by Vin Cafe (ages 21+). Interested in submitting your homemade sauce? Contestants receive two complimentary tickets! Fill out this form and email it to events@epcrossing.org. 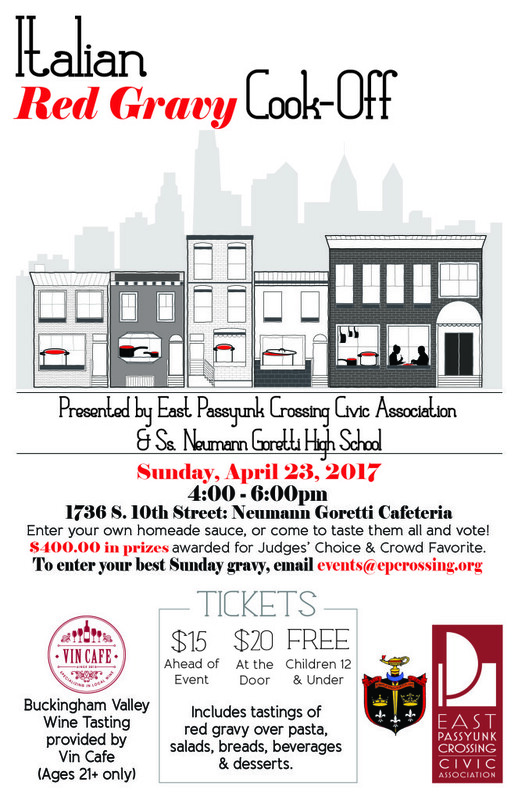 All proceeds benefit the East Passyunk Crossing Civic Association. A very special thank you to our sponsors: Dr. Valentino Cuillo DPM, Triangle Tavern, Vin Cafe, and our venue host Ss. Neumann and Goretti High School. Posted in eventcalendar, events, marketing & events.